An energy saving technology, but it might not be that big of a deal in the winter. Waste heat from old fashioned light bulbs can help heat the building. The new "low waste heat" CFLs are great in the summer when you're not trying to heat the building, but winter? Maybe you want the waste heat from old style incandescent bulbs. Savings you expect from changing light fixtures might be partially eaten up in higher heating costs. I hear that a lot of big office buildings figure-in the waste heat from lighting, electronic equipment and even body heat as part of their energy equation. In the summer, it's a different story. If one is trying to cool the space, a cool light bulb is better. 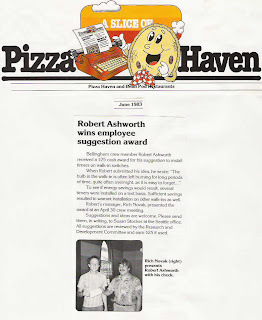 Back in the early 1980s, I won the employee suggestion award for a chain of restaurants. Working as a custodian in the Bellingham location of Pizza Haven, I noticed people kept forgetting to turn off the light bulb in the walk-in cooler. A hot light in that refrigerated space just means the refrigeration has to work harder to pump out more heat. My suggestion was to put in a florescent bulb. Or, if not a different bulb, I suggested a spring operated timer on the light switch. 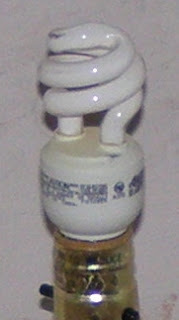 They didn't call them CFLs back then, but even in the early 80s there were a few types of compact florescent light. Pizza Haven went with the timer on the switch instead of the florescent bulb. Back in the early 80s, the forerunners of CFLs were a lot more expensive. Click to enlarge if you wish to see article. "A slice of life." So think about how your lighting effects heating and cooling. CFLs are great, but sometimes that doesn't matter. In winter, you may want waste heat. I know some physicists would look at this even more in depth; like studying where the heat is being created in the room. Light bulbs help to heat a room, but heat rises. If the light fixture is in your ceiling, it still might be better to use another heat source located closer to the floor. On the other hand, it depends on whether you are heating a multistory building, or not. Economists will consider the fuel used to create heat. A natural gas furnace might be cheaper than figuring-in heat from wasteful electric lights. Fitness centers often figure-in waste body heat from a room full of exercising folks as part of their energy equation. One could call this the "waist reduction waste heat equation." A friend of mine suggested that his gym install generators on all the stationary bikes. I told him that they already figure-in the heat of friction and body heat when heating the room. A generator wouldn't do much good as all the expended energy is ending up as heat in the room anyway. Now in the summer, that's a different story. If the gym is air conditioned, generators might help run air conditioning. I doubt generators would make that much difference. Is it worth the cost of the generator? Some stationary bikes are set up to turn a fan. Remember the Schwinn Aerodyne? Circulate the air with your cycling. Better yet, cool yourself riding a real bike across town. I've noticed that moving through the air keeps me cool even on a hot day. I've never driven a car and I've always lived in a small space which doesn't require much energy to heat. Compact lights, yes, but what about compact living?